This man is thinking about how he hasn’t been to the doctor’s for a checkup in a while and how he needs to do that. 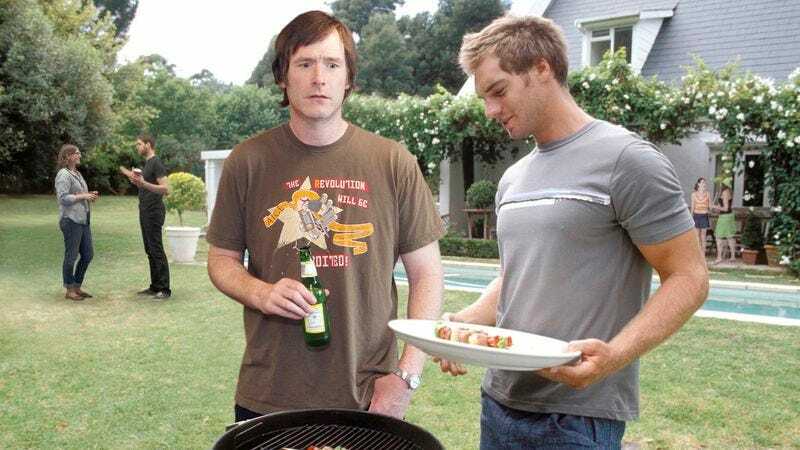 GAITHERSBURG, MD—Local man Marshall Platt, 34, came tantalizingly close to kicking back and having a good time while attending a friend’s barbeque last night before remembering each and every one of his professional and personal obligations, backyard sources confirmed. While cracking open his second beer as he chatted with friends over a relaxed outdoor meal, Platt was reportedly seconds away from letting go and enjoying himself when he was suddenly crushed by the full weight of work emails that still needed to be dealt with, looming deadlines for projects that would take a great deal of time and energy to complete, an upcoming wedding he had yet to buy airfare for because of an unresolved issue with his Southwest Rapid Rewards account, and phone calls that needed to be returned. According to sources, Platt tried to put his responsibility-laden thoughts out of his mind and loosen up by opening another beer but suddenly remembered a magazine subscription that needed to be renewed by Friday, a medical bill he thought might now be overdue, and the fact that he needed to do laundry by tonight or he would run out of clean socks and underwear. While the barbeque’s host chatted with Platt about how excited he was to see the upcoming Superman movie, sources confirmed that all Platt could think about was the fact that his recently married sister was coming to town next weekend and was supposed to stay with him, which reminded him that he needed to clean his apartment, which reminded him he needed to buy extra bedding for his sister to sleep on, which reminded him that he had to make an after-work trip to Bed Bath & Beyond, which reminded him that he would be tired after work and wouldn’t want to go to Bed Bath & Beyond, which reminded him that he also needed to go to the grocery store because his sister would think he’s irresponsible if she saw his empty refrigerator, which reminded him that he and his sister aren’t as close as he’d like, which reminded him that his parents already had a house and two cars by the time they were his age, which reminded him that he’s been with his girlfriend for over five years and that while everything was going fairly well, he felt overwhelmed by the prospect of marriage and the mounting pressure to propose. Accounts confirmed the man nearly convinced himself that all his responsibilities would be taken care of in due time and that he should just relax when a friend mentioned a recent road trip he had taken with his wife, which prompted Platt to mull over the fact that he still needed to renegotiate the lease terms of his 2010 Jetta, a task he was delaying until he had a fender bender repaired. In addition, Platt began thinking about the number of opened envelopes on his kitchen table, some of the contents of which, he remembered, were actually important and should be rechecked before he throws them away. “This was great, though,” he added.